The gutter is an important part of your home and protects the exterior of your house from rain damage, ground erosion and prevents landscaping from getting washed away. Failing gutters can also provide a harbor for insects, which can later enter your home from your crawlspace and basements. Keeping your gutters in good repair can save you money, increase the value of your home and reduce the potential for rot. 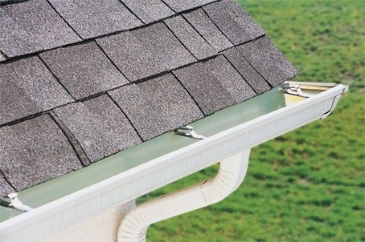 Even a well-maintained gutter can eventually need replacement. If you find yourself in a position where you need to complete a repair, hire a professional roofing company with the experience needed to complete your project. Properly maintaining your gutters can enable you to spot potential problems before they start and reduce the need for emergency roof repair. Over time, branches, twigs, leaves, nests and critters may begin to build a home in your gutters. This prevents your gutters from working properly and can result water accumulating in the gutter and not properly draining. Eventually, water may begin leaking into your attic and leave you with costly repairs. A professional roofer can inspect your home and inform you about any damage that needs to be addressed. There are some things you can do on your own to ensure proper gutter maintenance. Clean your gutters monthly using a pair a working gloves. Clean the gutters effectively to ensure proper flow of water that drains from your roof. Check for damage during the spring and summer months if you live in the Palo Alto, Menlo Park and Sunnyvale areas in California. If it’s raining, walk around your home and make sure the flow of water is getting diverted correctly into the gutter and not flowing over the sides of the gutter or house. Look for leaks and any other problems and call a roofer if necessary. You can plug holes using a patch of the same material, but it’s best to hire a professional. Once you start getting leaks in one area, it could be an indication of a bigger problem with the overall structure of the gutter. Gutters typically come in vinyl, steel, copper and aluminum. Our professionals can guide you and help you choose the best option for your home. Vinyl provides the cheapest option, and copper is generally the most expensive. Copper is a highly attractive and durable material that tends to have a lifespan of 75 years or more. Visit https://sheltonroof.com for details about the types of services we offer and to get a free quote for your project. Your home is more than just a place to give you shelter, have family gatherings and protect you from the elements. It also provides you with a source of equity and is the single most expensive purchase an individual will make in their lifetime. Protect your roof and it will provide you with years of comfort and hassle-free use. Don’t wait until the next time it starts pouring down rain to get your roof checked. It doesn’t matter if your project is commercial or residential in nature; call us now for a quote and talk with our professional roofers to protect your investment.